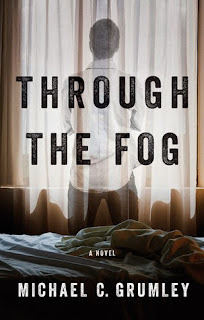 Michael C. Grumley, an American author, has woven an intriguing tale of dreams, visions and abduction, in his new book, Through the Fog , which is a short novel. You can read it in just an hour or two. Two weeks after his eighteenth birthday, everything changes for Evan Nash. When he injures his head after being run down on his bicycle, he begins having strange, harrowing visions whenever he tries to sleep. He turns to psychiatrist Shannon Mayer for help. Mayer has troubles of her own: her daughter has been kidnapped, and she's desperate for answers. Though she's at first skeptical of Evan's accounts, it quickly becomes clear that his mysterious ailment may be the key to finding her child. Soon Evan's visions prove essential to the case but at a terrible cost. Evan and Shannon face an agonizing decision: Should he risk himself to save the girl? Evan Nash, an 18year old high school boy wakes up every night, after his accident, with his whole body drenched in sweat from screaming. No it is not because that he sees a nightmare, instead he has strange visions covered in mist and fog. And that's why Dr. Shannon Mayer, a shrink, is treating him under her wings, but every single day is a challenge for to diagnose Evan's problems. She says she never seen somebody like Evan! And when one day Evan's visions guide him to the location of Mayer's abducted daughter, things get real messy when Evan falls into a coma. Can he save her? Will he come out of the coma? What is his problem? Read this book to find out the mystery. The writing is fantastic and the plot is tightly wrapped up with twists and turns. Yes there are some I-didn't-see-that-coming moments that will completely captivate you. The element of mystery is very strong and that will keep you on your edges. The prose is crisp and short with engaging narrative style. The characters are well-developed and in fact draws a lot of similarity from any every day characters. Evan is a loner kid, who is bullied because he is short and weird. But strangely, Evan doesn't feel the pain from bullying, although he is scared enough to confront them. I never thought that Evan would want to help Shannon despite of the risk to his life. Shannon is a caring mother, shrink and a determined and fearless woman. Shannon's sister and Evan's mother are the two supporting characters which were also equally strong enough to make us feel their presence in the story. Overall, the characters that the author crafted have enough depth to pull you into their troubles and pain. The pace of the book is really fast, moreover, I also felt the plot to be quite thought-provoking. The author made his story quite believable, but I felt the climax could have been much better. The emotions described in the book are also quite vividly portrayed, especially Evan's mother tears and Shannon's pain for her lost daughter. To be honest, I could I really liked the book cover, Evan floating through the mist. Verdict: Read the book if you enjoy reading a great thriller that will keep you hooked onto your seats. Courtesy: Thanks to the author, Michael C. Grumley, for giving me an opportunity to read and review his book. Michael C. Grumley lives in Northern California with his wife and two young daughters where he works in the Information Technology field. He’s an avid reader, runner and most of all father. He dotes on his girls every chance he gets. He just released his second book “Amid the Shadows” in September 2013. This sounds like something I would love to read so I have added to my TBR! I love a good plot twist, especially those I can never see coming myself. And having the characters sort of draw from every day ones in a unique way means they are easy to relate to. Great!